So, four days here and already so much accomplished. 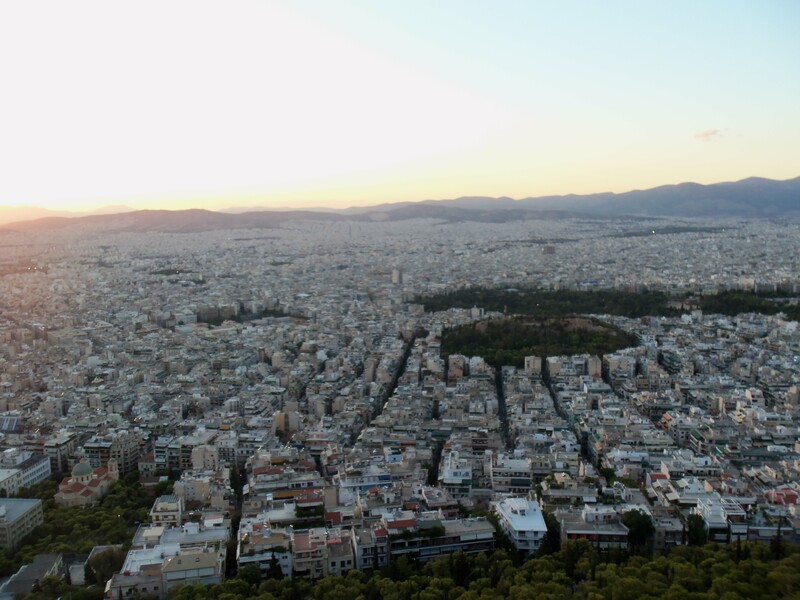 We arrived Tuesday evening and within the first few hours of being here we immediately went out to dinner at an authentic Greek Restaurant where we had several appetizers (mezes) along with pork, rice and French fries. Since that night we literally have not stopped moving. 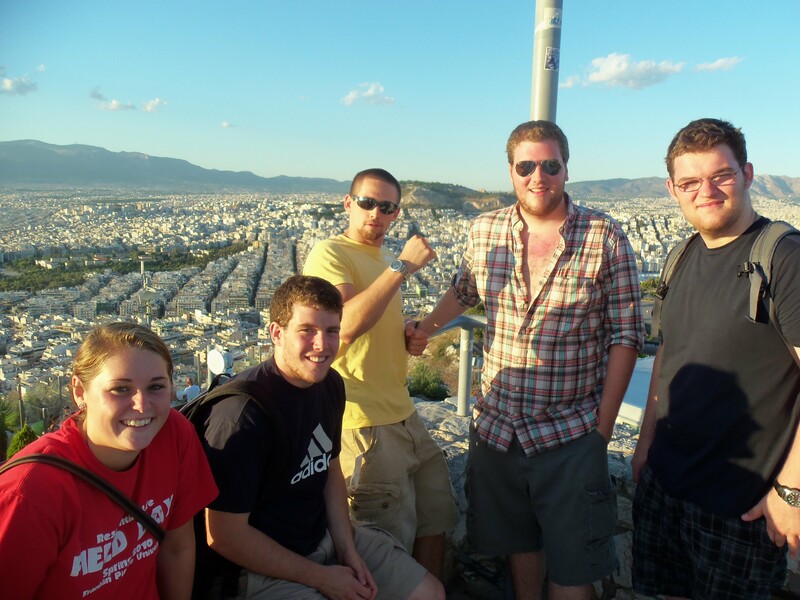 Walking is key while in Athens for us, and I personally have only taken a taxi once. Our second day here we spent the day exploring Athens. We walked around for hours looking at markets, shops and essentially finding our way around. This is where we found several animals hanging from windows, body and all, including chicken, lamb, and a rabbit that was skinned of its fur, except for the tail that is. Then for our lunch we had an authentic Greek salad, which most Americans would be surprised to find has no lettuce in it. The salad itself was fresh with cucumbers, tomatoes, red onion, green and red pepper, and olives with a large chunk of feta cheese on top with oil. It was very good, rich in flavor and fresh in taste; almost felt like it was picked right from a garden. From there we went to hike Lyakittos Mountain and watch the sun set on Athens to close our second day (the picture above is the view from the top). The hike was a bit steep but was well worth it and the view is indescribable, the picture doesn’t do it justice. 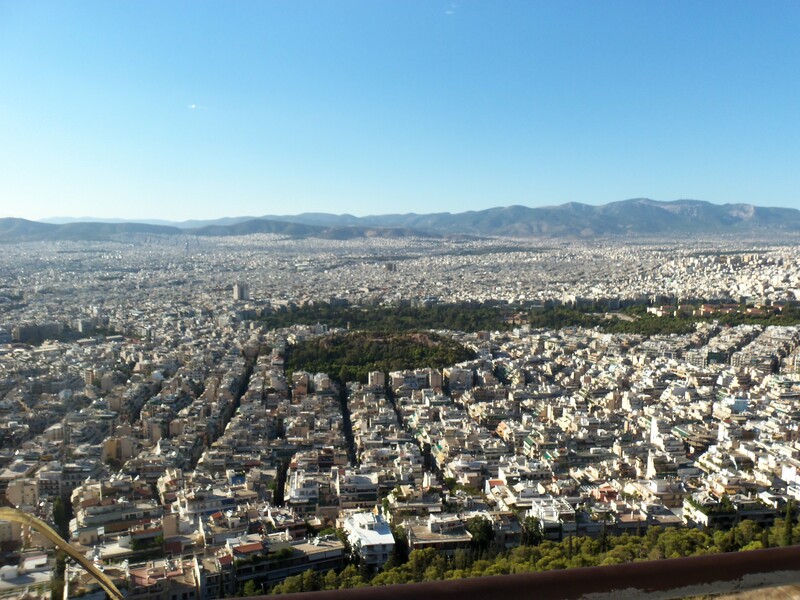 From the top we could see most all of Athens and main landmarks included the coastline and Greek Island, Zeus’s Temple, Acropolis, and the Olympic Stadium. Which leads into what we did on day three. 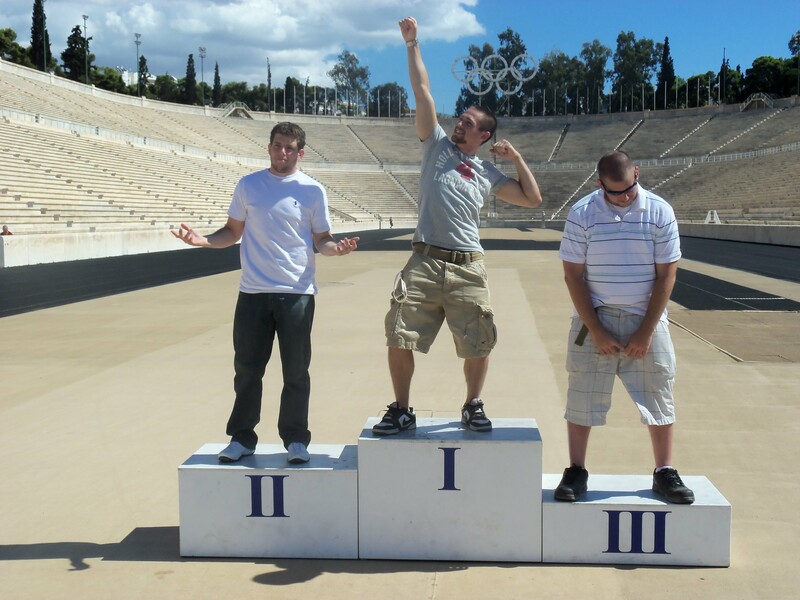 On Thursday a few of us went out on our own and went to Zeus’s Temple and the Olympic Stadium. Both landmarks were again, indescribable. Upon entering the stadium we were given headsets to listen to audio clips as we walked around the stadium which told us historical facts about different parts of the stadium. The architecture for both the Olympic Stadium and Zeus’s Temple is of course ancient but is extremely solid historical artifacts. During the night as a class we went to a traditional Greek Dance where performance danced to tunes of traditional Greek music. The culture is different yet the same, it is hot here, high 80’s to 90’s so normal summer clothing back home is what is worn here. The language barrier is a bit difficult but most people speak some form of English and are extremely helpful. I’m trying to learn the language as much as possible but it is hard, I know two or three phrases but that’s about it. Lifestyle differences include meal times, dinner isn’t usually eaten until 8:00 or 9:00 at night, and generally a slower process than in America. I’m excited to start classes and apply what we will/have learned in the realm of Mass Communications, Media Studies, Production and Journalism to society here and compare and contrast the different global communicational aspects. 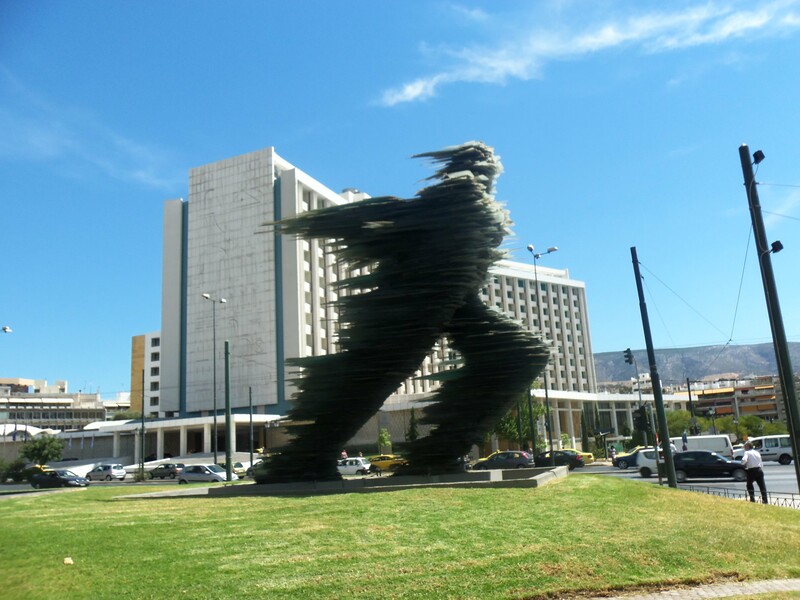 Today, Friday, we had a scavenger hunt as part of our class project and though my group couldn’t find many things on our list, something extremely interesting that we did get to see was the “Running Man” was built only out of broken pieces of glass for the 2004 Olympic Games. That is an extremely shortened version of what we have been doing the past several days, I’m sure I left some stuff out, I would have talked about more but I’m on my way out to experience more. that you need to write more about this subject, it might not be a taboo matter but usually people don’t talk about these topics. To the next! Many thanks! !